Not to mention that all of the characters look like something Rob Liefeld would’ve scribbled on the back of his trapper keeper…. and I’m actually at a loss as to whether I should be amused or slightly offended that the Toronto superhero is a giant tree that shoots maple syrup out of his hands. That sounds like something a comics writer would put in as a joke. Now, correct me if Im wrong, but isn’t the largest portion of hockey’s market in the souther US older retirees and baby-boomers. If I’m not mistaken on that, then your suggestion of focusing on tradition and hokey’s history makes significantly more sense from a marketing standpoint. Trying to sell the sport to kids with gimmicky mascots that wear dog-shooting jackets (the oldest trick in the book) just cheapens the whole thing. 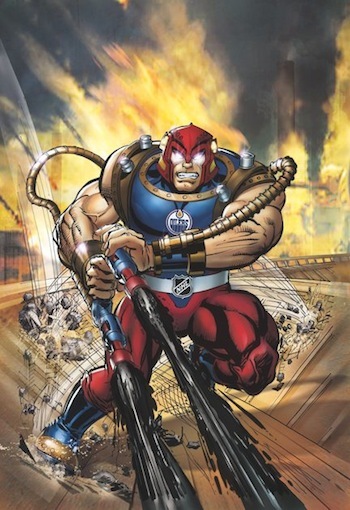 I’m not much of a hockey fan, but painting the NHL to look like Arena football or *shudder* the XFL is just sad. 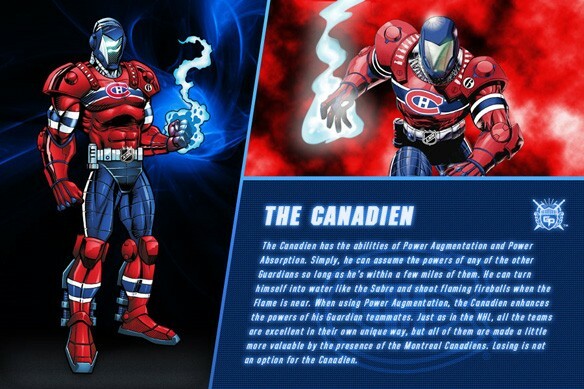 See the sworn enemy of the NHL Guardians – The Anti Guardian Project League of Unpleasantries at http://www.blackhodown.net. They were banished to the Island of Misfit Hockey Teams many years ago, but now they’re back and they’re pissed!